What to take to the Christmas buffet? We had the work Christmas buffet today. Everybody takes a contribution and it is always a fantastic spread, with leftovers to last a few days as well. Money seems to be getting sucked continuously out of my purse at the moment with all the Christmas celebrations. I wanted to take something healthy that wouldn’t break the bank. 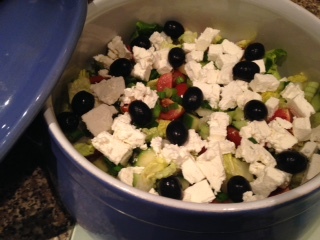 I decided on this frugal version of a Greek salad. There are always lots of carbohydrate at these events – sausage rolls, sandwiches, pork pies, crisps, etc – so I thought a Greek salad would be welcome. It was very easy to make last night and the ingredients weren’t expensive. I bought them from Sainsbury’s on the way home from work and the salad cost £3.50 not including the dressing. From the store cupboard for the vinaigrette I used 3 tablespoons of olive oil, half a teaspoon of Dijon mustard, 1 tablespoon of cider vinegar and salt and pepper. Combine all of the salad ingredients. Mix the oil, vinegar and mustard together in a jug and add seasoning to taste. Pour over the salad just before serving and mix well. This Greek salad went down a treat! The feta – cheap because it is made with cow’s milk so isn’t the genuine stuff – is just as good as the real thing at about a third of the price. I took mine in a lovely big ceramic bowl that I bought recently in my favourite charity shop for £1.50. Thank you, an excellent idea. A very similar salad will be winging its way to my works buffet as well. I think it sounds delicious, and had I been at your party, I would really have appreciated having something with low carbs.